Anyone who followed our and SEMA’s advice to apply for booth space before April 6 can start the Priority Booth Space Selection Process today. Emails were sent out Thursday to early-registering exhibitors with details about how to pick a spot under the Specialty Equipment Market Association’s process. 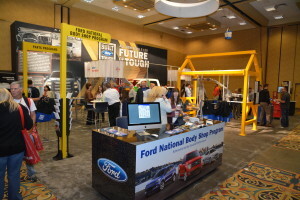 The process runs three weeks, and the floorplan will be updated here as exhibitors claim their locations in a sort of NFL Draft, according to SEMA. Make sure SEMA has your phone number; they’ll call you when it’s your turn on the clock to find out where you want to be. If you registered and didn’t get an email by Friday or have another question, contact sales@sema.org at 909-396-0289. If you haven’t registered for a spot yet, you can still do so here, but you can’t pick your location until after the three-week signups.